It’s no secret that home and business owners alike are shifting their values toward a more sustainable solution and lifestyle. It’s also a basic fact that many traditional types of building insulation have not been optimized or improved with eco-friendliness in mind. However, there are some more innovative and modernized insulation materials that you can feel confident installing in your property due to their lack of waste and overall sustainability levels. 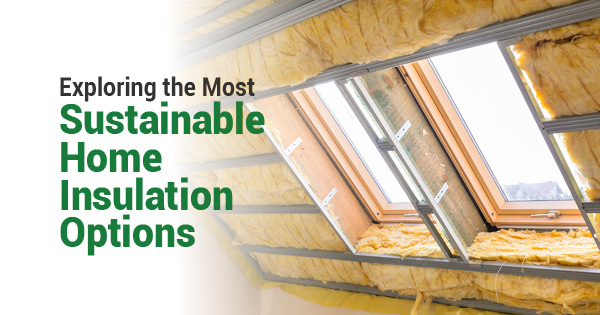 Here are just a few top insulation materials that are both efficient and eco-friendly. “Today, scientists make aerogel by removing the liquid from silica under high pressure and temperature. What’s left is a material that is very light and more than 90% air. Aerogel’s molecular structure makes it difficult for heat to pass through. As insulation, aerogel comes in sheets that can easily be tacked on to the studs in a wall,” writes John Perritano on HowStuffWorks. While it is considered an eco-friendly option, Aerogel insulation is also quite expensive, costing, on average, $2 per foot or more. Nexcem Insulated Concrete Forms (ICFs) are among the sturdiest and most sustainable building materials available. Nexcem is the only Insulated Concrete Form that does not uses polystyrene or foam, but instead uses our proprietary Nexcem material; a cement bonded wood fiber composite. Not only do we forego oil based products but our material is 80% recycled clean waste wood by volume. Nexcem ICFs weigh 70% less than conventional concrete and has superior insulation. Nexcem ICFs also have long-term benefits regarding waste reduction and overall efficiency. In fact, according to the U.S. Department of Housing and Urban Development, ICF walls can save homeowners 20% to 25% on annual heating and cooling costs. Finally, Nexcem ICFs are easily one of the most durable insulation materials: Our material won’t burn, melt or dent like other ICF systems and it won’t rot or deteriorate with moisture like conventional construction. Ultimately, Nexcem ICF systems can cut final costs on a property by an estimate of $0.75 per square foot, but whatever type of insulation you decide is best for your home, it’s best to prioritize sustainability and invest in the future. For more information about Nexcem ICF construction, contact us today.